An old familiar watering hole of Winnipeg is The Toad in the Hole Pub & Eatery, where you can count on playing darts, wolfing down yorkshire pudding, bangers and mash, possibly catch an amusing celtic band and generally have a good sociable time. As an old Winnipeger, I have spent more than my fair share of evenings at the Toad. And while much has remained the same, there are changes too… most notably an adjoining whisky bar… as in an entire room paying homage to the water of life! Alas we reached before the whisky bar’s official opening hour of 9 PM so instead perused the whisky list book and randomly ordered one I hadn’t yet tried – Tullibardine 20 year 43% – described as well aged with vanilla, cocoa and honey. Nope. Simply not my dram. Didn’t even finish it. I instead found myself nipping into my companion’s whisky. As we were about to drain the last drop (of hers!) and carry on our merry way, we were informed the Whisky Bar was now open and would we like to pop over? The doors opened to the hallowed halls… everywhere your eye landed was whisky… from shelves lining the walls with whisky bottles and boxes to the focal point of the room – a full floor to ceiling stock of whiskies behind the bar. 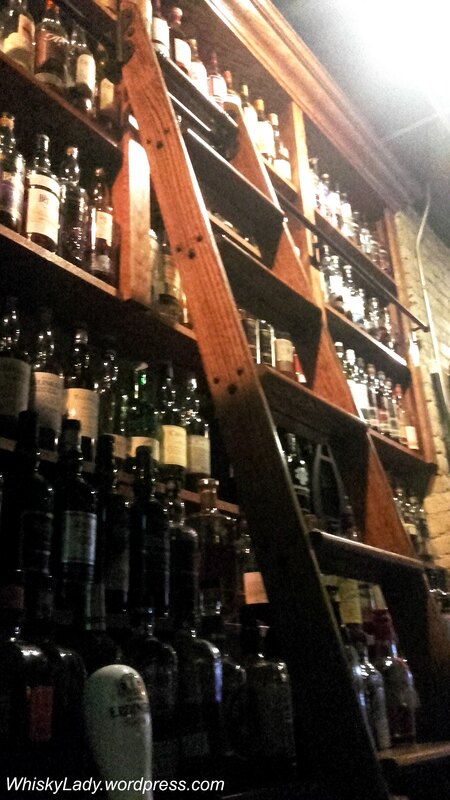 The Winnipeg whisky bar’s pride and joy is the ladder which slides across the wall of whiskies to help select the preferred dram. It harkens back to an earlier time with precious dusty tomes (or in this case whisky) well beyond easy reach could be access only by the ladder. A suitable metaphor since the biggest advantage of a well-stocked whisky bar is an opportunity to try just one dram many of a whisky well beyond your reach for a full bottle! The venerable ‘bar-keep’ kept up a merry conversation with us regarding their whisky collection and journey since opening in 2012 in between whipping up cocktail after cocktail. What was his dram recommendation? BenRiach 15 year (1999/2015) 55.1%. The only problem with this whisky? It was gone too quickly! Most amusing was when he brought out an aroma kit with its samples from balsamic to decay… ugh! My companions took a whiff, I was not about to destroy my dram by assaulting my olfactory senses. It was interesting to see one of these kits though which are touted as helping hone your ability to discern different elements in a whisky. Me? I’m quite happy with my novice impressions! If you happen to find yourself in Winnipeg and are craving an environment that stocks a decent collection with a knowledgeable whisky guy, go no further! This entry was posted in Whisky General and tagged BenRiach 15 year, The Toad in the Hole Pub, Toad in the Hole, Tullibardine 20 year, Whisky watering holes, Winnipeg Whisky Bar by Carissa Hickling. Bookmark the permalink.